You don't even know the half of what kind of smear campaigns people can launch and ruin your life. In fact, you might even want to delete this blog entry because it feeds them knowing that you are scared for your reputation. It's like encouraging a bully. I think I've mentioned before, this is strategic demographic targeting. You are going to be very high up on that list. And yes, I do still think you're naive, but it's cute. There is a whole lot of evil that people do to screw with whomever they want to. I hope you never really have to understand that fully, I really do. We know you're "honest and ethical and won't cheat on examinations" and that you know what you're doing. This is that naive part, that you think it's about that. It's very antisocial. This is where we're going. By the time it's much worse, you will have died young or retired. But it is miserable, a lot of patients will die, a lot of doctors will be ruined. I've been warning you guys, they want you gone. They want you gone in the most ugly and emasculating way possible. Hey, if they totally try to rip you a new one, at least you'll find out who your friends are and if your family genuinely respects you and is behind you 100%. I had the same reaction to these nasty leaches. So do I let them bleed me for a couple hundred bucks per year, and waste my limited time on their MOC that's of value only to their greed, or go ABPS boards... if i pay per year, then in 10 years do I pay another few thousand and submit to their degrading "secure exam". I quit paying ACP dues since obviously they are also self-serving and don't care about the corruption. Slime. At least you are grandfathered in IM. If you have to participate in MOC for work, try paying for only one of the subspecialties, as they will still report you as "participating in MOC". I think they will only stop this nonsense if we at least try to hurt their bottom line, by paying as little and as late as possible. It is really so simple, Wes. The ABIM is not the ABIM of 1936. Today, it is a greedy self-serving imposter. The voluntary nature of certification has been imprisoned by amateur medical bureaucrats. They print indentured contracts called medical board certificates and shower them on physicians just to make their big bucks. These are bizarre pretend physicians leading the pack as if they were escapees from an insane asylum. The strange part is everyone goes along because these executives are immoral as well as mentally unsound. They have created fear as the number one control factor. The bird of joy has flown. But these bogus bureaucrat doctors have been exposed. Their cover has been blown. Hidden in the tax filings they say there was no lobbying. Well Rich and Bob, Chris and Lynn, you got caught with your pants down. They claimed quality was achieved by cutting costs. But every child knows only quality creates quality. They tried to claim there was an inverse ratio of cost and quality. The greater the amount spent on healthcare, the lower the quality. The lower the cost in healthcare delivery the higher the quality. This is propaganda. But then when did the ABIM ever produce anything of quality? They ABIM proves that Choosing Wisely is a lie, because the ABIM spends most of their revenues on the executives and their creature comforts. Unfortunately the highest paid executive at the ABIM never showed up for work, but instead put their efforts into lobbying for PPACA (aka Obamacare, yes, I voted for him.) and SHE gets the worst marks in the history of the ABIM. That CEO gets the worst marks for knowledge of medicine as well. Let's talk about the certification tests and the MOC. It is a disaster. The poor quality of that educational side of things was produced on a shoestring budget. Even the highly paid current CEO admits that they "got it wrong." Well they got everything wrong since Walter Bierring the founder died in 1961. It was quality then because it was voluntary. Humanitarian and not-for-profit. We need to broadly inform the American public about the stench emanating from Walnut Street in Philadelphia. We need more Newsweek articles. We need 60 Minutes or 20/20 or CNN to point their unblinking camera lens on Rich Baron's face. We need John Q Public to demand Congress why this organization is wholly unregulated. We need new blood at the ABIM. We need a new petition to demand that Baron, Johnson, Krumholz, Emmuel and the entire ABIM and ABIM Foundation and ABIM 2020 all need to go away. We need honest, frugal, responsible, and transparent inclusive leaders to run this organization. The current leaders are too old, too corrupt, too entrenched, too obtuse and too inept. In the military and in medicine, when faced with an enemy with deep roots, we use every means necessary to take down the opponent. If a strategy doesn't work, we outflank or redirect our efforts and try everything all at once at times. Just as you have noted in prior blog posts, this is the end of the beginning. As such, we redeploy and we attack from multiple fronts with the basis of our effort on DEFUNDING THE ABIM. No ABIM $$$=No ABIM Power. And captures the essence exquisitely. I've watched this from Canada (we need to guard that it does not repeat itself up north, the tentacles are already spreading). Consider submitting it for publishing it in the wider mainstream media ? I plan to keep all of my options (legal and otherwise) open regarding the ABIM and their parent organization, the ABMS. 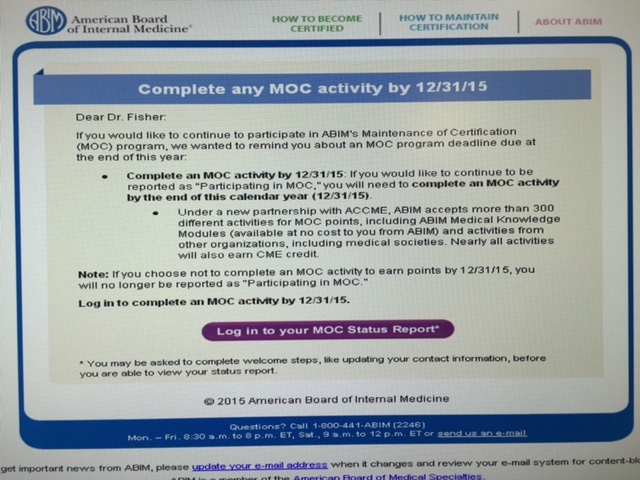 For now, I have no intention of participating in "MOC" to earn "MOC points." Such an exercise is meaningless to me and my patients. I have played the game long enough. I will wait to see what happens and then decide. I would encourage others to do the same. I've said it before, it's all "please the stockholder"
This is actually small-potatoes and minor: I have read that insurance covers "GENERIC HEART transplant, and the thinking is who cares where it came from. Has anyone seen the paperboy recently? 26 years in the naval reserves! I must have had a sixth sense about it. A salute and quadruple wing tip to you, Dr. Wes. Sir, we will be flying along side you! The crazy thing to me is that while ABMS and ABIM (and other boards) have use jumping through all these hoops, other health care professionals (nurse practitioners, etc.) are taking our jobs. If Cassel did not show up for work, and claimed to be working 35 hrs per week, I wonder if some of the millions paid in salary could be reclaimed. Amazing summary of this corrupt saga, thank you Wes ! What about staging a hunger strike in front of ABIM or ABMS HQ to force change or at least bring more media and governmental attention to this issue ? Great summary and I do believe that you can lead us to a better place. Please don't forget to mention that the Choose Wisely campaign is responsible for an unknown number of deaths based upon their fraudulent recommendation to avoid complete revascularization in AMI. This disastrous guideline must be the branding of their incompetence and hence danger to the population. This is off topic a bit but plays into the well known bureaucracy in medicine. Former head of CMS, Marilyn Tavenner, who implemented Obamacare is now a lobbyist for a cabal of health insurance companies. This is the essence of medicine nowadays--make big money off the hard working backs of docs in the trenches. While we are over-tested and over-scrutinized, these moochers mint millions. This is part of the Great Replacement. Quality DOES NOT MATTER, and to an even greater extent YOU DO NOT MATTER. The limits will be pushed while nurse practitioners take your jobs, and by the time enough people die and cry foul then the doors will flood open for ready and willing H-1B Visa doctors who are grateful to be in this country. They will actually feel and be a thousand times more 'entitled' than most American doctors ever were and probably never grateful enough to pledge allegiance to the USA flag, but this will NOT be the media spin. Actually, a lot of you people will turn to suicide, which is very sad because only a very small minority actually deserve that. From an economic standpoint, 0bamacare was brilliant. Consumers forced to buy product or else pay a penalty. Mergers beget monopolies, so consumer protections are stripped away and prices get out of control--but not ENOUGH out of control, so there's the TPP. All that matters is that all premiums and fees get paid. The legislators who got rich on this aren't concerned about the well being of Americans: just die. This is the plan. Make us money, or die. This is America now. I know for a fact that you can buy some of the BEST insurance COVERAGE but it does not mean you will get HEALTHCARE. The banksters control that now, and whatever makes money is what is done. A patient can cause a transaction to occur but it will not mean that something useful has happened--that's not how this new system works. The new face of medicine wears a Jason Hockey Mask. I miss the old face of medicine. So everyone keep fighting a good fight, corruption is everywhere not just this, a little overwhelming...sometimes I think maybe Putin will help us, he's doing a great job protecting us from isis and imagine other possibilities? In the meantime, thanks Wes and others proving some research and leadership and trying to fix this very broken system. Hunger strike = do no pay MOC. Alternative board prn. Quit paying MOC and ACP dues until they represent internists, rather than their own political agenda and financial interests. drbob is right. The apparent plan is to replace primary care physicians, which includes internists, with mid-level providers. This initiative, already being rolled out across the country, is rendering the physician "specialty" of internal medicine meaningless, since mid-level providers are now de facto internists with prescribing authority and an authorized scope of practice that is essentially identical to that of internists and family practitioners. It is also a fact that the gap between the income of internists, family practioners, and mid-level providers continues to close. Savvy medical students are taking note and choosing fields other than primary care. The future of internal medicine looks bleak. Mid-level providers are being embraced by insurers and CMS, and are hailed as the saviors of primary care (because, of course, there is a physician shortage for gosh sakes)while physicians are viewed as costly vestiges of old medicine. More insurers and employers are routing patients to drug store minute clinics for most primary care. Ironically, mid-level providers are practicing both outpatient and inpatient medicine without ABIM certification, while we, because of our alleged deep pockets, are forced to jump through the ABIM's hoops to certify and re-certify in a specialty that is going the way of the dinosaurs. It's unlikely that most patients lining up at the local minute clinic are wondering whether the NP they are waiting to see has the ABIM seal of approval. At a minimum, physicians practicing primary care alongside mid-level providers should not be required to certify or re-certify in internal medicine as a specialty if in fact it is really no longer a specialty. Specialty certification should only be required of those physicians who are practicing a true specialty. Alternatively, the ABIM should demonstrate its commitment to internists by taking steps to reverse the ceding of our specialty to mid-level providers. A few years ago, I was having financial problems (imagine that as an internist these days), and complained to ACP that cost for review course was less for NP than ACP member... They said it was because they earned less, until I pointed out that I earned less, but they did not care, they just wanted money... They favored NP over their own members. Perhaps Cassel's political agenda is for internists to be replaced by NPs, or perhaps it's just a result of current politics in which she and ABIM/ACP have played a major role. I don't know why pilot license (per Tierstein) and NP boards are so much less expensive, except that agenda of ABIM and ACP needs these bloated millions to pay themselves and their political agenda. Clearly it's not about safety or "quality". NP is "board certified" for $395 or as low as $270 if American Nurses Association Member. Recert q 5 years as low as $200 for ANA members and "proof of professional development which typically consists of practice hours and continuing education". Oh, and the recert gives them credit for actual patient care, and no MOC. Is the public demanding MOC for NPs, or was the public demand for MOC for MDs just more of Cassel's self-serving nonsense? In the meantime, I quit MOC and ACP. I've paid enough to be treated so badly by these people. Yes, the profession of medicine is better than that. You are better. We all are better than that! i got interested in medical practice ..
and SADLY what i see in France even in well known hospital is not far from what you describe ..
and they are playing the SAME GAME ! We need to organize and sue not only these bastards but any insurance company or hospital requiring certification for payment of services or for privileges. Take them to court, jury trial so real people can see once all this is divulged, all of it and with great haste. The longer we wait the more doctors will be forced into early retirement by this sheer madness. One thousand dollars donated to a legal fund should raise some serious cash and hire the best attorney money can buy. I enjoy your blog and support everything you are doing. There is one thing I fail to understand. Why can't physicians REALLY unite around this cause and force change? There are reportedly ~ 900,000 active physicians in the United States (http://kff.org/other/state-indicator/total-active-physicians/). MOC negatively impacts all of us. Yet, only a minority seem to be doing anything about it. For example, only ~ 7,500 have taken the pledge of non-compliance with MOC (http://www.petitionbuzz.com/petitions/nomocvow). Worse yet, for all of the attention the National Board of Physicians and Surgeons has received, only ~ 2,000 applicants have been completed and a miserable 11 hospitals accept this certification as an alternative to the ABMS (as of July 27, 2015 https://nbpas.org/News/news/). You're doing your part in the fight. Paul Teirstein is doing his part. Some of the medical societies have spoken up against ABMS (all too politely I would add). How do we rally the nearly 1 million physician troops together to meaningfully fight this? To@psolere: We have solidarity with you! We know more of your pain than we can say. Nous avons solidarité avec vous ! Abiento! J R, you eloquently stated using the most exacting terms possible, "We need to organize and sue not only these bastards but any insurance company or hospital requiring certification for payment of services or for privileges." There are several lawsuits that need to be filed against the ABIM specifically and the ABMS generally for their participation as the umbrella organization that claim no oversight responsibility. Of course they have obligations and liability to the 24. Whatever they think or say don't bother to talk with them. Discuss it with THEIR INSURERS. If they did not have great liability they would not have a risk management team to lie about all the ways that they are not legally liable. The ABMS insurers, who put themselves at grave risk, will tell you something entirely different, and once you see the policies and the premiums they pay you will understand what I am saying. I probed the waters. The ABMS executives and house staff are totally vulnerable to the ABMS members misstatements, omissions, obfuscations and Mafioso style legal and police/surveillance tactics. Yes, ABMS has liability--even for the illicit deeds of the ABIM. You may find in discovery how deep and how high the corruption goes at the ABMS and their partners. To get started, you need the best qui tam legal team to present to in the country, because the DOJ will quickly recognize that your civil case is of high merit and priority. One must know how to present it, only a highly skilled team of attorneys could do that. There is whistleblower money for the witnesses who come forward to testify. A lot of money is a stake. Look at the revenues of the ABIM alone over the past seven years. At least a half a billion dollars. Extend that out. The IRS will take them all the way back once they find out the wrongdoing, intentional and malicious. Once the DOJ gets drift of the slime in the apple barrel. There are also great employment attorneys that mostly like will work for a contingency. Violations have occurred and physicians swim like a swarm of fish in fear. There is a good attorney, but there are many. I found one from court records. She fought for a wronged ABIM employee over women's rights in the workplace. She' been on TV. Already familiar with the ABIM. These are workplace rights issues violations(insurance and hospital privileges) and so much more. There are federal and state laws to protect you. How stupid to just sit there for years and take the beating right in the face year after year. Fight. You throw the punches from now on. Get up off the ground and fight! You have a legal basis for suing them. They lobbied without claiming those lobbying effort to the IRS. All Cassel did was lobby and advise while working for the ABIM. What a scam. ABIM and cronies even used third parties to hide other activity. They were very sloppy and it all can be proven. Name the ABMS and all the culpable insurers and every hospital in the country in your suits. It will take a very large team, so shop around. Get a cease and desist first and they will settle immediately when the judge finds out what they (ABMS, ABIM) have done to the constitution, bill of rights, even the legal system and who the ABMS has used to screw physicians and the public. Yes, whatever the ABIM has done, the ABMS knows about it. It is their business to not only know but to synchronize and coordinate efforts. After all it is a vast corporate enterprise with deep pockets and much to gain or lose. Would you let a rogue organization like the ABIM or ABP act alone. Absolutely not! Get a team of 8 civil liberties attorneys as well. You will understand once you get to discovery what they have done to every physician and American. If you don't know by now then you better find out what I am saying by investigating. Don't hold your breath for the New York Times or Washington Post front page headline, ABMS caught in a massive fraud and racketeering scam that spans over sixty years. Your cases will all be settled to avoid jail time and contain costs for the survivors of the ABMS scandal. Hit them with a racketeering charge. They will never survive even if it never goes to court. You know what I not even sure the government wants the ABMS anymore, otherwise bloggers would have been shut down a few years ago. And Newsweek would never have been allowed to run the opinion pieces. Think about it. Fight now. These people are NOT going to just give up, there's too much money at stake. The only solution is for physicians to boycott these parasites and stop sending them money. Unfortunately, physicians are too timid to do that. The scumbags at the ABIM and other specialty boards will have to be FORCED to stop this nonsense, otherwise it will continue on some level. Thank you for posting this. I am an internist intensivist and I just went through the challenges of taking my second recertification exam in internal medicine. I took the exam and passed it the first time in 1997, then 2007, and now 2015. Your words are powerful. Thank you for posting them.